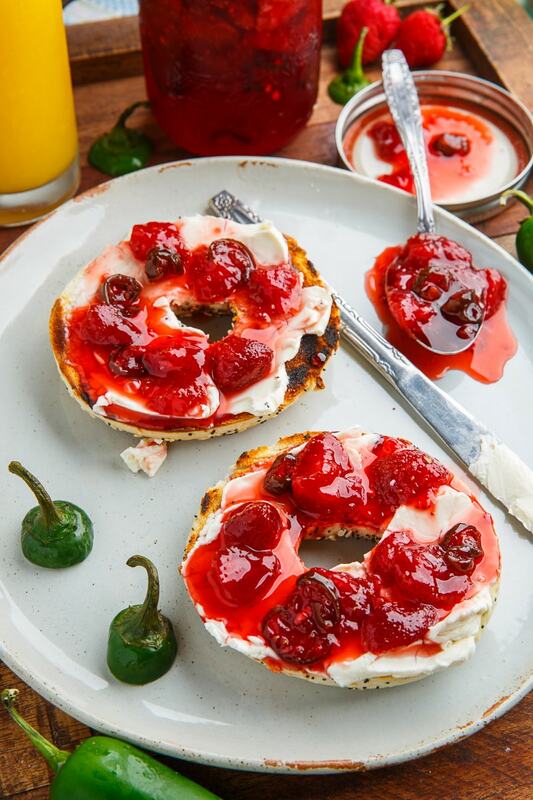 A fresh homemade strawberry jam with a hit of jalapeno heat! One of my favourite things about summer is fresh strawberries! I enjoy eating them by the bowl full and using them in tasty recipes and the one that I make every summer is strawberry jam! Using fresh strawberries to make your own jam is a great way to preserve that burst of summer in a way that can be used throughout the year, long after the local strawberry season is over. I always make some basic strawberry jam and I like to change things up by adding extras like jalapenos! 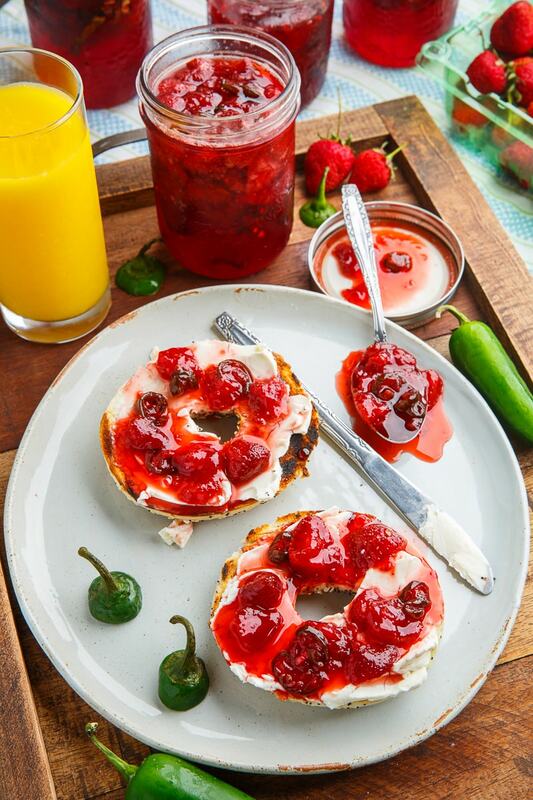 The recipe for this jalapeno strawberry jam is pretty much your basic strawberry jam recipe with the addition of as many jalapenos as you wish to add the amount of spicy heat to meet your tastes! 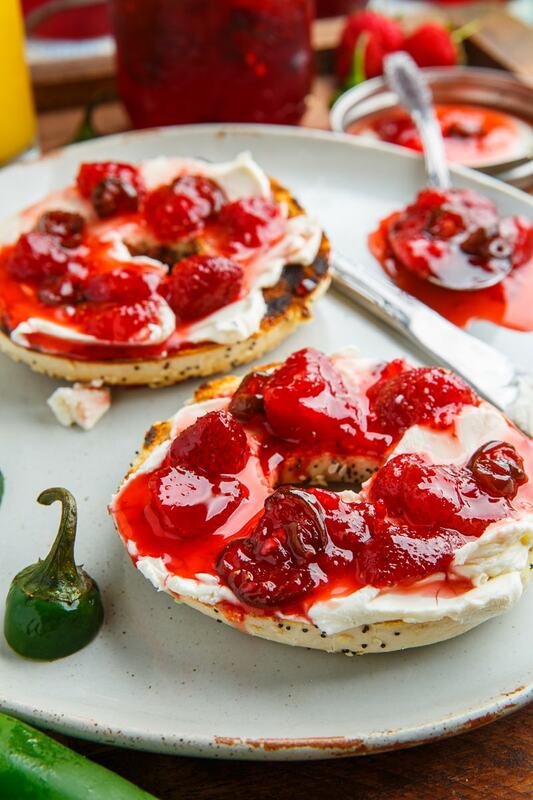 This jalapeno strawberry jam can be used wherever you enjoy regular strawberry jam and I like it on a bagel with cream cheese! Bring the strawberries, jalapeno, and sugar to a boil over medium-high heat in a large sauce pan. Skin any foam off before poring into sterilized jars and storing in the fridge. Option: Use more jalapenos for more heat or remove seeds for less heat.